Preston Hardware has Ottawa’s largest selection of Milwaukee Tools. This legendary brand has produced the most precise and reliable power tools available for almost a century. We only carry the best, and that’s why we’re so proud to offer our customers the full line of Milwaukee Tools. Visit Preston Hardware and shop our vast selection of Milwaukee Tools, including drills, saws, grinders, impact tools, wrenches, rotary hammers, planers, and a range of other tools and accessories that will help you get the job done right the first time. The M18 FUEL ½” Hammer Drill is the Industry's Most Powerful Drill delivering Up to 60% More Power, is Up To 1.5” Shorter and is Up To 2X Faster Under Heavy Load. The POWERSTATE™ Brushless motor delivers 1,200 in-lbs of torque and 2,000 RPMs providing fast drilling through demanding applications. At 6.9” in length this is the most compact drill in its class giving better access into tight spaces and reducing fatigue. The REDLINK PLUS™ intelligence ensures maximum performance and protects from overloads, heating or over-discharge. The REDLITHIUM XC5.0™ Battery Pack delivers more work per charger and more work over the life of the pack than competitors. The all metal ratcheting chuck is the best in class by providing increased bit grip strength and corrosion resistance. The M18 FUEL™ ¼” Impact Driver is the Fastest, Most Compact, and Most Powerful tool in its class. The POWERSTATE™ Brushless motor delivers up to 2,000in-lbs of torque and up to 30% Faster Driving speed, increasing users productivity for the most demanding fasteners on the job. With the Most Compact tool at only 4.59” in length, users will have more access in tight spaces. The REDLINK PLUS™ intelligence ensures maximum performance and protects from overloads, heating or over-discharge. The REDLITHIUM Battery Pack delivers more work per charger and more work over the life of the pack than competitors. The 4-Mode DRIVE CONTROL™ provides greater control over output speed and power for greater versatility. Self-Tapping Screw mode provides faster installation time by reducing stripping of fasteners. The M18 FUEL™ ¼” Impact Driver is the Fastest, Most Compact, and Most Powerful tool in its class. The POWERSTATE™ Brushless motor delivers up to 2,000in-lbs of torque and up to 30% Faster Driving speed, increasing users productivity for the most demanding fasteners on the job. With the Most Compact tool at only 4.59” in length, users will have more access in tight spaces. The REDLINK PLUS™ intelligence ensures maximum performance and protects from overloads, heating or over-discharge. The REDLITHIUM Battery Pack (not included) delivers more work per charger and more work over the life of the pack than competitors. The 4-Mode DRIVE CONTROL™ provides greater control over output speed and power for greater versatility. Self-Tapping Screw mode provides faster installation time by reducing stripping of fasteners. The Milwaukee M18 FUEL™ 16" Chainsaw delivers the power to cut hardwoods, cuts faster than gas, and delivers up to 150 cuts per charge. The unit is designed to meet the performance, durability and ergonomic needs of professional landscape maintenance, power utility, and the installed M18 user. The POWERSTATE™ Brushless Motor maintains speed under heavy loads without bogging down to outperform small gas engines and higher voltage systems. REDLINK PLUS™ intelligence ensures maximum performance and protection from overload, overheating and over discharge. The M18™ REDLITHIUM™ High Output HD12.0 battery delivers unmatched run-time in all applications. M18 FUEL™ technology allows the unit to reach full throttle in under 1 second providing ultimate control and productivity. The M18 FUEL™ 7" / 9" Large Angle Grinder is the world's first 18v LAG delivering the power of a 15A corded large angle grinder, is up to 2LBS lighter, and has 9" grinding capacity. Providing high performance, advanced ergonomics & legendary durability, this grinder is designed to complete the toughest grinding, surface preparation, and cutting applications with any 7" - 9" accessory. The POWERSTATE™ Brushless Motor provides 6,600 RPM and higher speeds under load for corded grinding/cutting performance. REDLINK PLUS™ intelligence ensures maximum performance and protection from overload, overheating and over discharge. The M18 REDLITHIUM High Output HD12.0 battery delivers unmatch run-time in all applications. Tool-free accessory changes using the FIXTEC nut and guard adjustments mean less downtime during work. Designed for the carpenter, remodeler and general contractor the M18 FUEL™ 7-1/4” Circular Saw from Milwaukee delivers the power of a 15A corded saw, cuts faster than a 15A corded saw and gives users up to 750 cuts per charge. The POWERSTATE™ Brushless Motor provides 5,800 RPM and higher speeds under load for corded cutting performance. REDLINK PLUS™ intelligence ensures maximum performance and protection from overload, overheating and over discharge. The M18 REDLITHIUM High Output HD12.0 battery delivers unmatch run-time in all applications. All magnesium guards and shoe delivers extreme durability for jobsite conditions. A built-in rafter hook offers quick and easy storage and an electric brake stops the blade quickly after cuts are complete for maximum productivity. The Milwaukee M18 FUEL™ 8-1/4” Table Saw with One-Key™ delivers the power of a 15A Corded Saw, 24-1/2” of Rip Capacity and Up to 600 linear Feet of cutting per charge. Designed for professional carpenter, remodeler and general contractor the Milwaukee M18 FUEL™ 8-1/4” Table Saw with One-Key™ is optimized for power, portability and productivity. The POWERSTATE™ Brushless Motor provides 5,800 RPM and higher speeds under load for corded cutting performance. REDLINK PLUS™ intelligence ensures maximum performance and protection from overload, overheating and over discharge. The M18 REDLITHIUM High Output HD12.0 battery delivers unmatch run-time in all applications. The rack and pinion fence system maintains accuracy and allows for quick adjustments. For maximum productivity, the tool has on board storage for the included accessory and a tool free guard and riving knife changes. An all metal frame provides durability for daily jobsite use. The Milwaukee M18 FUEL™ SUPER SAWZALL™ delivers the power of a 15A Corded Reciprocating Saw, Faster Cuts than the legendary Milwaukee 15A AC SUPER SAWZALL™; and Up To 150 Cuts in 2x12 SPF per charge. Designed to perform in the toughest applications the M18™ FUEL SUPER SAWZALL™ combines Milwaukee's legendary performance and durability with the portability of the M18 platform. The POWERSTATE™ Brushless Motor Provides 3,000 SPM and higher speeds under load for corded cutting performance. REDLINK PLUS™ intelligence ensures maximum performance and protection from overload, overheating and over discharge. The M18™ REDLITHIUM™ High Output HD12.0 battery delivers unmatched run-time in all applications. The 1-1/4" stroke length removes more material with each stroke and On/Off Orbital action provides agressive cuts in wood and smooth cuts in metal. Variable speed trigger and 5speed dial provide maximum speed control for any application. The QUIK-LOK® blade clamp allows for toolless blade changes and a rafter hook provides a convenient way to store the saw between cuts. The M18™ REDLITHIUM™ HIGH OUTPUT™ HD12.0 Battery Pack provides 50% more power and runs 50% cooler vs M18™ REDLITHIUM™ HD battery packs. The massive increase in power elevates the performance of the entire M18™ system and drives the next breakthrough in M18 FUEL™, delivering the power of 15A corded product. It delivers fade free power and runs substantially cooler through heavy applications, allowing tradesmen to push their cordless tools harder and longer than ever before. The M18™ REDLITHIUM™ HIGH OUTPUT™ HD12.0 is the best performing cold weather pack ever made, providing increased power in extreme cold weather conditions (below 0F / -18C). It provides the most work per charge of any professional power tool battery in the industry, driving full corded replacement on the jobsite. The REDLITHIUM™ HIGH OUTPUT™ HD12.0 battery is fully compatible with 150+ M18™ solutions. The M18™ REDLITHIUM™ HIGH OUTPUT™ XC6.0 Battery Pack provides 50% more power and runs 50% cooler vs M18™ REDLITHIUM™ XC battery packs. The optimized combination of size and increased power provides a great solution for the entire range of M18™ products. It delivers fade free power and runs substantially cooler through heavy applications, allowing tradesmen to push their cordless tools harder and longer than ever before. The M18™ REDLITHIUM™ HIGH OUTPUT™ XC6.0 provides increased power in extreme cold weather conditions (below 0F / -18C) and delivers more work per charge, driving corded replacement on the jobsite. The REDLITHIUM™ HIGH OUTPUT™ XC6.0 battery is fully compatible with 150+ M18™ solutions. The Milwaukee Folding Table Saw Stand is designed to be used with the Milwaukee M18 FUEL™ 8-1/4 Table Saw with One-Key (model 2736). 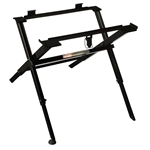 The stand features all steel construction to handle the conditions of a jobsite. Compact, lightweight design allows for easy transportation and storage. A quick attach latching system keeps the saw lock onto the stand when in use and easily detaches once you are done.